The tyres on my new bike were looking a bit squared off, and the tread was very low, so i ordered some new tyres. 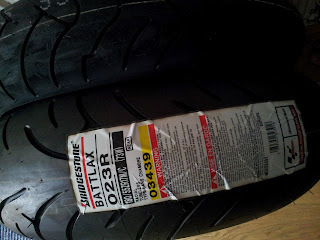 After reading some review i decided to give the Bridgeston Battlax 023R's a try. These are supposed to be Sports Touring tyres with a harder compound rubber in the center for high mileage and softer more sticky compund rubber on the shoulders for going round corners quickly. A nice choice! Prefer 2cts myself but its more about what you do with them!